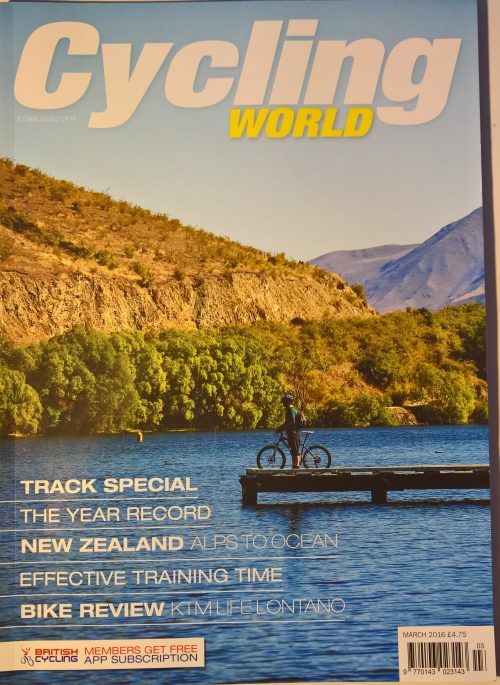 Cycling World is a bicycle magazine from the UK. It aims at road cyclist and people who are interested in the professional road racing scene. It covers many aspects of cycling, such as the production of bicycles, bike fairs, or some basic bike maintenance tips. Cycling World surely isn’t made for leisure cyclists, who head out every now and then. They give tips about training, nutrition and bike maintenance. Although various aspects of cycling are looked upon, its main focus is on road bikes. Most ads cover road bikes, most articles show road cyclists and so on. Besides that, it appeals to the daily commuter, or people who travel longer distances on their bike. Because of its style (for more see “writing and style”) it is not suitable for people who like it plain and clear. With around 80 pages in total it isn’t very long nor very short, although the front is very big and it has many pictures in it. The table of contents goes as follows. First, some news around cycling such as the Olympics, or cycling expos, then same reoccurring segments named “regulars”, such as “Ask Anita”. This is followed by “UK & Ireland Cycling” and a special feature, on things like track cycling or a specific region such as wales. Last but not least there is “Bike Stuff”, which includes tests and reviews. At the very end Cycling World looks at overseas cycling, let it be Australia, India, or some other country. The adverts included in the Cycling World magazine do most of the time look quite similar to the actual stories. That is, because they are as playful and wildly colored as the ads. As advertisements are not clearly marked as such, it is sometimes very hard to distinguish ads from the content. Every other page you will find an advert, sometimes it goes over two pages. Somehow the Cycling World magazine reminded us a lot of early webpages around the year 2000 and a little while after. By that we mean – lots of colors mixed together, no recognizable style throughout and oddly looking colored backgrounds. It is completely different to all today’s fancy magazines, and looks somewhat outdated. The actual content though is precise, sharp, and nice to read. We especially liked the recurring series “from the workshop”, which is very well written and has helpful and detailed pictures in it. Many other magazines could learn from that. The webpage of Cycling World greets its visitors with a funky tune, what we found to be annoying (last visit on the 21.12.2016). It goes in the same direction as what we criticized about the advertisements. We were unsure about it being the actual webpage or an ad which popped up, because most of the time, it are Popup-Ads which behave like that. Besides that, it has some good sections, as accommodations, Cycle Hire, or retail. When you hit “sneak a peak”, you get a glimpse at the current issue of the magazine. Furthermore they publish news articles, interviews and videos on that webpage.